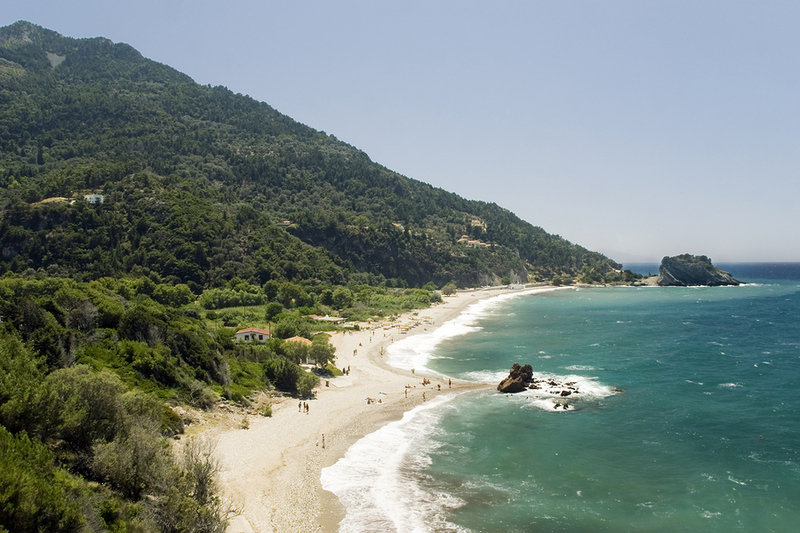 Samos is one of the loveliest islands in the Aegean, fertile and green with rolling hills covered in pine forests, with valleys of vineyards and olive groves… all this and good beaches too. 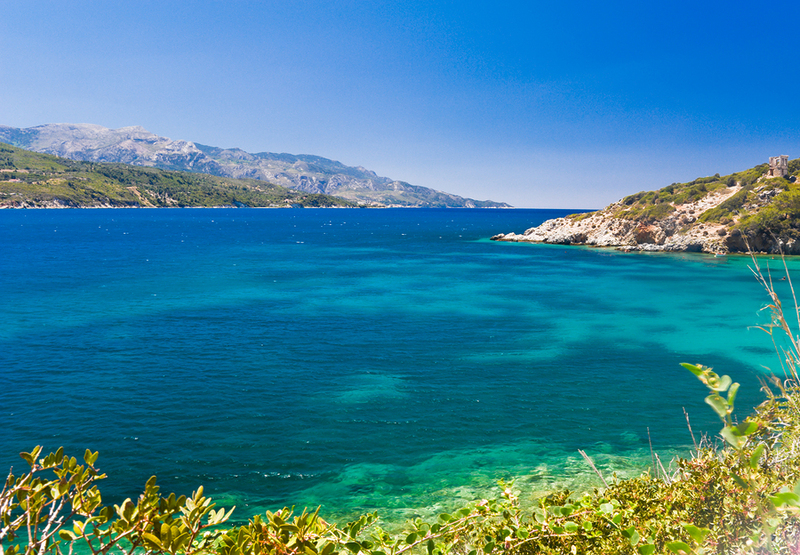 Little wonder that it has been admired down through the centuries, and today is a very popular holiday destination. Even Antony and Cleopatra are known to have relaxed together on Samos. Due to its popularity you might be better avoiding a visit in high summer, when hotels are block-booked by tour companies, but when the spring flowers bloom, and again in the autumn when the vines are heavy with grapes, Samos is a dream Greek island destination. Its vines provide a dessert wine that is as sweet as honey and exported around the world. 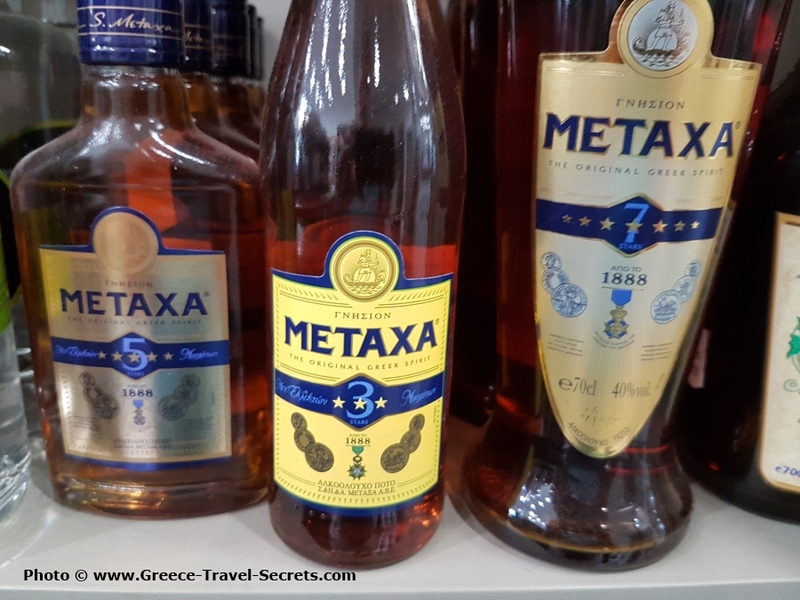 Samos grapes are also used to make the popular Greek drink, Metaxa. Samos Town, also known as Vathi, is the island capital and its white houses spread themselves between a swathe of green hills and a beautiful horseshoe-shaped harbour. In the upper town, Áno Vathi, a maze of narrow shaded cobbled lanes winds around, a world away from the bustle of the port below, although that is where you will want to be at night-time, and there are lots of pedestrianised areas to keep the traffic at bay. The long esplanade is the place to stroll in the early evening, perhaps stopping for an aperitif in a cafe under the palm trees. Samos has a long and fascinating history, too, having been inhabited since about 3000 BC, and much of the story is told in the first rate Archaeological Museum. This has one of the best collections of votive offerings in Greece, thanks to the popularity of the Heraion Sanctuary, where the goddess Hera was worshipped. The museum’s other star feature is a 5m-high marble statue from the 7th century BC, a kouros every bit as beautiful as any you will find in the National Archaeological Museum in Athens. 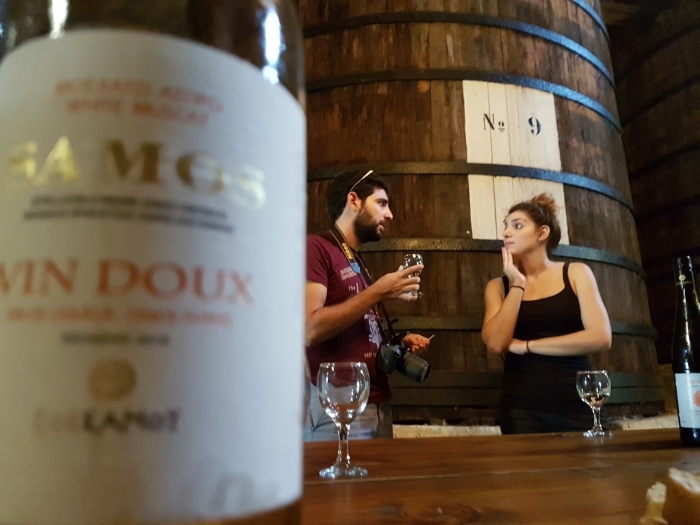 A Tasting in the Museum of Samos Wine. Photo (c) Mike Gerrard. Heraion is 21km to the southwest of Vathi, and the first temple on the site was built in the 8th century BC, replaced by another in the 6th century BC, but this was destroyed soon afterwards in an earthquake. Work began on a replacement but this was never completed although it was much used despite that. The site is a little confusing, even after much archaeological work, but it fills in part of the picture of the way Samos used to be. Nearby is Pythagoreio, the original capital that was built in the 6th century BC. It has now become a very fashionable tourist town, with commercialism running rampant, especially in the waterfront tavernas. Its attractions include the remains of some Roman baths and the startling Efpalinion Tunnel, an aqueduct almost 1km long hacked out through the rock to bring water to the town. 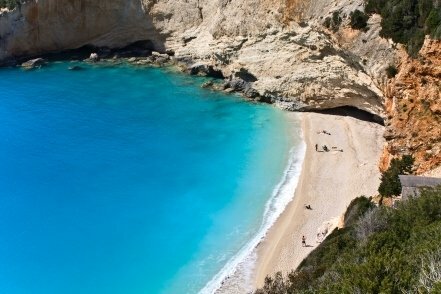 Pythagoreio was named after one of Samos’s most famous sons, the mathematician and philosopher Pythagoras, born here in about the year 580 BC. Little is known for sure about his life, but he did develop advanced theories not just on mathematics but also music and the harmony of the universe. Samos has its own international airport. In summer there are charter flights to Samos from many countries in Europe. Outside the holiday season the island has flights from Athens by Olympic Air, from Thessaloniki by Astra Airlines, and from Chios, Lesbos and Rhodes by Sky Express. 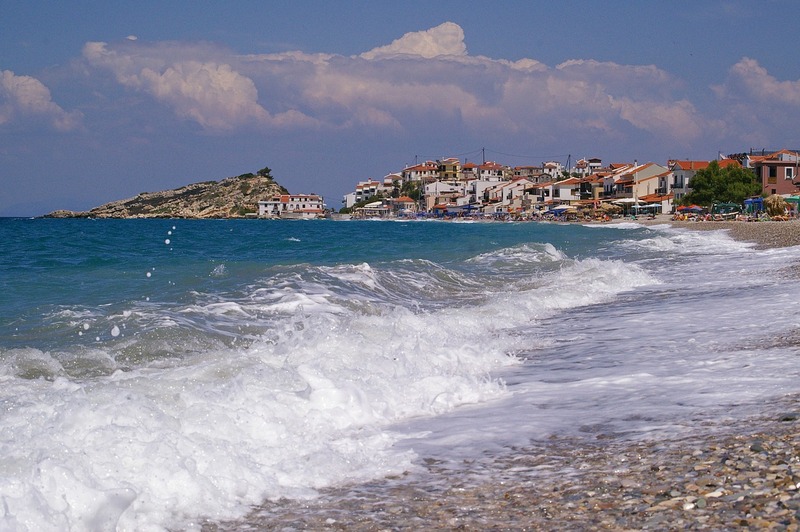 Samos is also well-served with ferries from Athens, from the mainland port of Kavala, and from other Greek islands including Fourni, Ikaria, Syros, Mykonos, Chios and Lesbos. The ferry from Athens takes at least 12 hours. In the summer months you can also catch a ferry from Vathy on Samos to the Turkish port of Kusadasi, with a return ferry in the evenings.